Lomonosov Moscow State University scientists published the results of a study of unique ultra-slow pulsar XB091D. This neutron star is believed to have captured a companion only a million years ago, and since then, has been slowly restoring its rapid rotation. The young pulsar is located in one of the oldest globular star clusters in the Andromeda galaxy, where the cluster may once have been a dwarf galaxy. Massive young stars die, exploding as bright supernovae. In this process, they throw off outer layers of material, and the core shrinks, usually becoming a compact and super-dense neutron star. Strongly magnetized, these rotate rapidly, making hundreds of revolutions per second, but they eventually lose their rotational energy and slow down, emitting narrow beams of particles. They radiate a focused radio emission that periodically passes the Earth, creating the effect of a regularly pulsating source, often with a millisecond period. 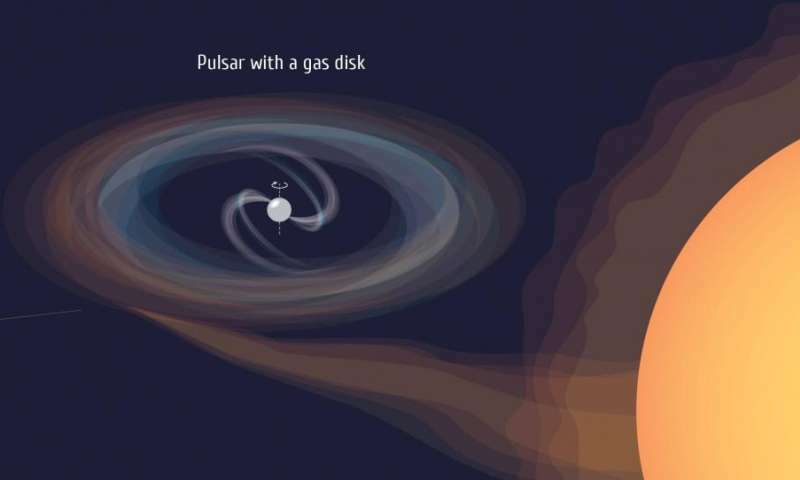 In order to restore its youth and accelerate its rotation, the pulsar can pair with an ordinary star. After teaming up to form a binary system, the neutron star begins to pull matter from the star, forming a hot accretion disk around itself. Closer to the neutron star, the gaseous disk is torn apart by the magnetic field of the neutron star, and the matter streams onto it, forming a "hot spot"—the temperature here reaches millions of degrees, and the spot radiates in the X-ray spectrum. A rotating neutron star can then be seen as an X-ray pulsar, while the matter that continues to fall into it accelerates the rotation. For some 100,000 years—a mere blink in the history of the universe—the old pulsar, which has already slowed to one revolution every few seconds, can once again spin thousands of times faster. Such a rare event was observed by a team of astrophysicists from the Lomonosov Moscow State University, jointly with colleagues from Italy and France. The X-ray pulsar known as XB091D was discovered at the earliest stages of its "rejuvenation," and turns out to be the slowest rotating of all globular cluster pulsars known to date. The neutron star completes one revolution in 1.2 seconds—more than 10 times slower than the previous record holder. According to scientists, the acceleration of the pulsar began less than 1 million years ago. The discovery was made using observations collected by the XMM-Newton space observatory between 2000 and 2013, which were combined by astronomers of the Lomonosov Moscow State University into an open online database. Access to information on approximately 50 billion X-ray photons has already allowed scientists from different countries to discover a number of previously unnoticed objects. Among them was the pulsar XB091D, which was also noticed by another group of Italian astronomers, who published their results several months ago. XB091D is only the second pulsar found outside of our galaxy and its nearest satellites, although two more such pulsars were subsequently detected using the same online catalog. The results of the first complete analysis of the X-ray source XB091D are presented in an article published by Ivan Zolotukhin, a researcher at the Lomonosov Moscow State University, and his co-authors in The Astrophysical Journal. "The detectors on XMM-Newton detect only one photon from this pulsar every five seconds. 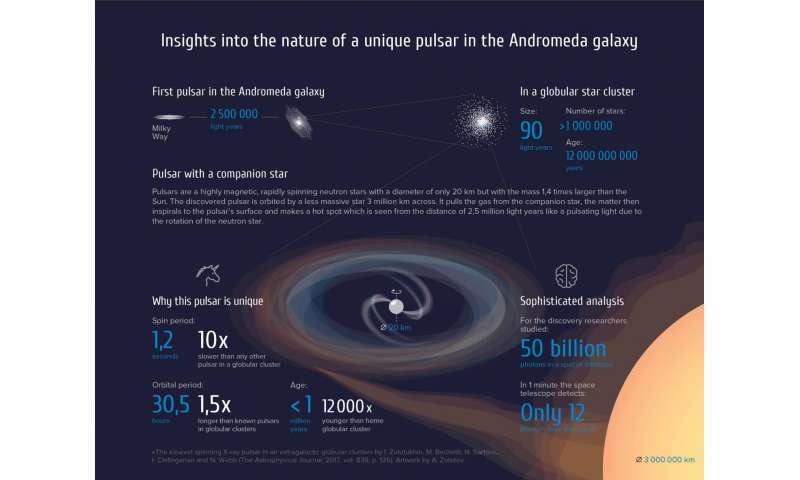 Therefore, the search for pulsars among the extensive XMM-Newton data can be compared to the search for a needle in a haystack, " says Ivan Zolotukhin. "In fact, for this discovery we had to create completely new mathematical tools that allowed us to search and extract the periodic signal. Theoretically, there are many applications for this method, including those outside astronomy." Based on a total of 38 XMM-Newton observations, astronomers managed to characterize the XB091D system. The X-ray pulsar is about 1 million years old, the companion of the neutron star is an old star of moderate size (about four-fifths the mass of the sun). The binary system itself has a rotation period of 30.5 hours, and the neutron star spins once on its axis every 1.2 seconds. In about 50,000 years, it will accelerate sufficiently to turn into a conventional millisecond pulsar. Astronomers were also able to determine the environment around XB091D. Ivan Zolotukhin and his colleagues showed that XB091D is located in the neighboring Andromeda galaxy, 2.5 million light years away, amongst the stars of the extremely dense globular cluster B091D, where, in a volume of only 90 light years across, there are many millions of old, faint stars. The cluster itself is estimated to be as much as 12 billion years old, so no recent supernovae resulting in the birth of a pulsar would have occurred. "In our galaxy, no such slow X-ray pulsars are observed in 150 known globular clusters, because their cores are not big and dense enough to form close binary stars at a sufficiently high rate," explains Ivan Zolotukhin. "This indicates that the B091D cluster core, with an extremely dense composition of stars in the XB091D, is much larger than that of the usual cluster. So we are dealing with a large and rather rare object—with a dense remnant of a small galaxy that the Andromeda galaxy once devoured. The density of the stars here, in a region that is about 2.5 light years across, is about 10 million times higher than in the vicinity of the sun." According to scientists, it is the vast region of super-high density stars in the B091D cluster that allowed a neutron star to capture a companion about 1 million years ago and begin the process of acceleration and "rejuvenation."